Set your camera in motion with this DollyPLUS with HeadPLUS Bundle put together by B&H, a complete motorized dolly system from edelkrone. The bundle includes a DollyPLUS motorized dolly with a dual LP-E6 battery bracket, a HeadPLUS pan and tilt head with a V-mount plate, a Focus Module for automated focus functions, and a Laser Module to measure distance and pinpoint your subject for accurate motion shots. The DollyPLUS has a load capacity of approximately 30 lb, including your camera and tripod with accessories, and the HeadPLUS can hold a camera up to 10 lb. Both the DollyPLUS and HeadPLUS can move manually or can be controlled via a smartphone app, which can also utilize the Laser and Focus modules during operation. The edelkrone DollyPLUS is a portable robotic tripod dolly that allows both linear and circular motorized camera moves on flat interior surfaces or tripods. It has a load capacity of 30 pounds. The DollyPLUS will automatically find its own center, so there is no worry about manually calibrating the system to your tripod and camera. You control the system via Bluetooth and it could include the DollyPLUS along with either the HeadONE, HeadPLUS, or HeadPLUS PRO which the DollyPLUS wirelessly pairs with. The edelkrone app is available for both iOS and Android and allows you to create linear or circular paths with keyframe points that you can manually control or you can program the DollyPLUS to move in a loop between two points. You can also adjust the move speed and your camera's shooting frame rate to create timelapse videos. The DollyPLUS is powered by either two LP-E6 or two L-Series type batteries. Compatible battery plates are not included and must be sourced separately. The default setting for the DollyPLUS is a straight slide. This allows you to either track side to side or dolly in/out on the lens. You can program multiple points along the straight-line path and move to any of those points or have the DollyPLUS loop between any two points. Using the easy path creation wizard enables you to create a circular path around any target you choose, with no measuring tools required. You can select several points on the curved path and make DollyPLUS go to any of them and as with the linear movement, you can have it loop between any two points. The edelkrone app scans the available devices in its surroundings and pairs with them automatically, giving you a single screen to control all devices simultaneously. It is available for both iOS and Android. The app allows you to create timelapse videos. You can have a simple transition between two keypoints or you can convert a recorded complex camera motion into a time-lapse with a single button. edelkrone's unique Dynamic Interval and Dynamic Step Size technologies allow you to adjust the time and camera speed independently of each other. All edelkrone motorized products use the same backlash-free gear design technology for perfectly repeatable, smooth motion for even the most demanding shots. All edelkrone motorized devices have a unique silent stepper motor technology that combines ultra precise stepper motor positioning with ultra silent operation. Stepper motors are perfect for precise motion control but until now their downside has been the noise they make. With edelkrone motorized devices, you will get the world's most precise positioning with the quietest performance. The DollyPLUS is designed to wirelessly connect to the HeadONE, HeadPLUS, or HeadPLUS PRO, providing a motorized head on DollyPLUS, which enables 4- or 5-axis camera motion that can be easily programmed and repeated. The devices pair instantly in the background and you still use the same app to control all devices together. Powers from two LP-E6 or two L-Series type batteries. Please note that battery plates are not included and must be sourced separately. Upgrade your shots with smooth, precise motion using the HeadPLUS Pan and Tilt Head from edelkrone. The sturdy aluminum and steel head supports a maximum equipment load of 10 lb. It can be mounted onto a tripod with a 3/8"-16 screw or used with the SliderPLUS with Slide Module for smooth, pan-and-tilt sliding shots. The head can be precisely controlled via the edelkrone smartphone app or it can be moved manually. When mounted on the SliderPLUS, you can track objects automatically to produce dramatic motion shots such as parallax effects. The head can also be programmed for time-lapse or special effects shots by recording motions and repeating them. With the separately available Focus Module, you can control focus at points during your motion. During a pan-and-tilt sliding shot, you can pre-program to live-switch between three targets and adjust focus during movement. You can also purchase the Laser Module which can record the distance and location of your subject, allowing you to track the object while in motion. The head also has a LANC port which allows you to trigger your camera's shutter with a separately available cable. The head folds flat which makes it easy to store in a production bag. 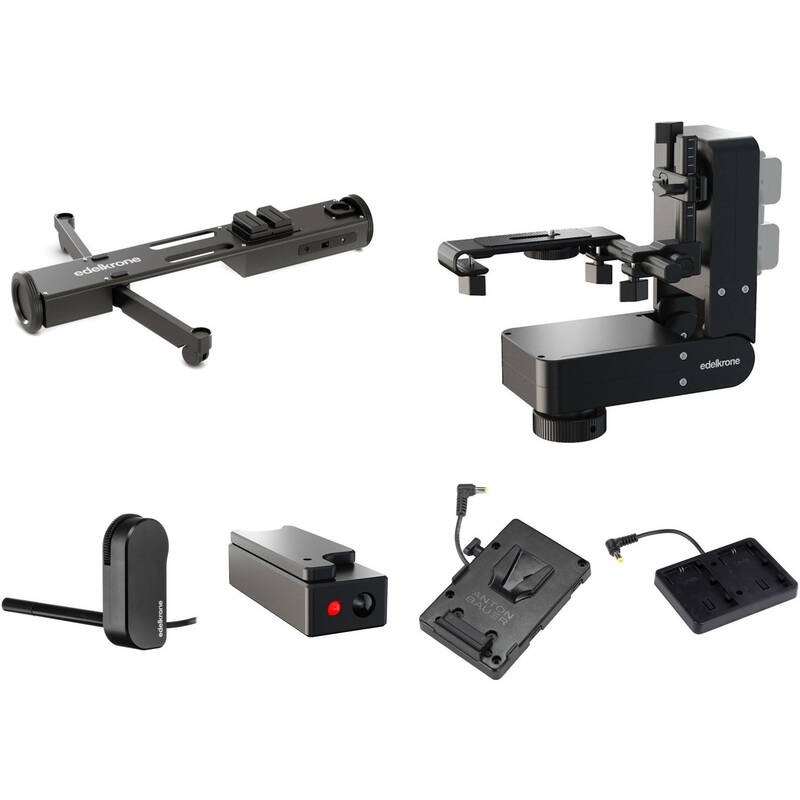 The HeadPLUS also includes an L-bracket with 1/4"-20 mounting screw for your camera, a LINK cable, and width extenders for use with the SliderPLUS legs. You can power the unit with a separately available AC adapter or optional V-mount, Gold mount, LP-E6, or NP-F battery plates. The HeadPLUS is made with CNC-machined aluminum and can hold an equipment load of up to 10 lb. It weighs under 5 lb and folds to fit in a bag. The head requires no calibration and operates smoothly and silently. You can either program it for automated motion or operate it manually. The HeadPLUS can be installed on a tripod with a 3/8"-16 mount, or used with the SliderPLUS with Slide Module for sliding shots. It can also be used with the SliderPLUS X, SliderPLUS M, and the previous generation SliderPLUS and SliderPLUS Pro. It comes with an L-bracket with a 1/4"-20 camera-mounting screw. Connect the edelkrone smartphone app via Bluetooth to control speed and record/repeat motions for time-lapses, visual effects, or other complex shots. With the optional Focus Module, you can set up to three targets for smooth transitions and keep them each in sharp focus during live motion. You can purchase the optional Laser Module to pinpoint your subject, learn its distance, and track it when performing complex pan-and-tilt sliding shots. Power with a separately available AC adapter or optional V-mount, Gold mount, LP-E6, or NP-F battery plates. Operates for approximately five hours and shoots 36,000 photos in time-lapse mode on 28.8Wh batteries. The Focus Module from edelkrone is designed for select stabilizers and sliders. It includes a coreless DC motor with a precision encoder for reliable and silent operation. This module requires the head module and slide module (available separately) in order to operate. Pinpoint your subject with speed and precision with the edelkrone Laser Module designed specifically for the HeadPLUS and HeadPLUS PRO pan and tilt slider heads. The laser module slides neatly onto the HeadPLUS slider head just below the camera mount and stays in place with a magnetic plate. The module integrates with the HeadPLUS app to instantly learn where your target is by aiming the laser and pressing a button. First it measures the distance, then it locks onto the subject to help achieve complex sliding pan-and-tilt shots. A LINK cable is included to connect the Laser Module to the HeadPLUS. Use this V-Mount Battery Bracket from edelkrone to power your HeadPLUS or HeadPLUS PRO pan and tilt slider head. The battery plate accepts a single V-mount battery and attaches to the side of the slider head. The plate also includes two D-Tap ports to power additional accessories such as a light, a wireless receiver, or a monitor. Box Dimensions (LxWxH) 29.7 x 6.5 x 4.7"
Battery Life: 5 Hours Continuous with 28.8 Wh Battery Max. Box Dimensions (LxWxH) 10.7 x 10.6 x 4.9"
Box Dimensions (LxWxH) 12.65 x 7.5 x 2.95"
Box Dimensions (LxWxH) 7.95 x 2.8 x 1.9"
Box Dimensions (LxWxH) 5.35 x 4.15 x 1.3"
Box Dimensions (LxWxH) 5.3 x 2.9 x 0.7"